After I returned from Boxing Day shopping, stacked my purchases in one corner of my room, and surveyed my available closet and drawer space, I realized I had no room for all of the cool new stuff I'd got. 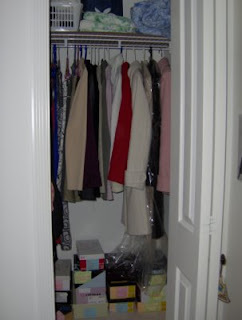 Unless I seriously rethought my clothing storage solutions, I was going to end up with a closet and dresser that explode clothes all over me...a bit like the scene in Shopaholic Takes Manhattan where the heroine misuses vacuum seal storage bags. Buy a new dresser and move one of the desks in my room to another part of the house. Possible cost: $100-200, plus a full day devoted to going to Ikea, putting together the dresser, moving the desk, and filling the dresser with clothes. Buy one of those clear plastic storage dresser units on castor wheels and put it in the space under my desk. Possible cost: $50. 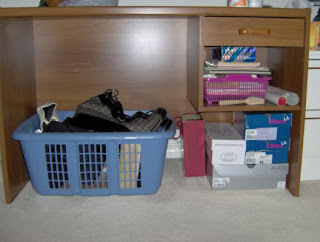 Move around my books so that a couple of shelves on my bookcase are empty, and then take clothes out of my dresser and put them on the empty bookcase shelves. Possible cost: $0-15, plus a full day devoted to moving books and bookcase shelves, shuffling clothes around. Thinking of my Visa bill for the next month with a pang, I chose the cheapest most hassle-free option, #3. As it turned out, the project quickly snowballed. 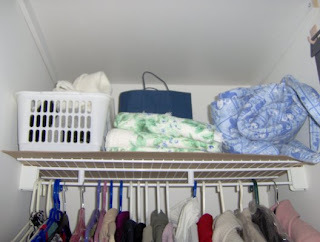 I moved the clothes out of the bottom two drawers in my dresser: thick sweaters I don't wear unless it's below -10 degrees Celsius outside, and old clothes I no longer wear out and become my lounge-around clothes because they're too good to throw away. Seeing the stacks of clothes on my bed made me realize how tacky they might look just piled up on the shelves, and how it might be hard to keep them organized and accessible. I took a detour to the dollar stores near my house and picked up several white plastic storage bins which became makeshift drawers on the bookcase. I'm pretty proud of this storage solution if I do say so myself. I don't feel too bad about putting my clothes in plastic bins because the contents of these bins are clothes I rarely wear but don't want to throw out or give away. 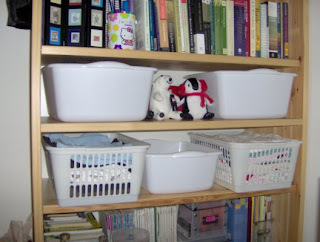 Right behind the polar bear and the penguin are a box full of clothing care items (spare buttons/sequins/thread, a sweater shaver, pins, etc.) and a lint brush. Sheer genius. I'm pretty happy with my room configuration now and glad that I now have a more functional, organized clothing storage solution. Phew. Now maybe I can work on filling up some of the space I made when I go to New York next month. Great post! I love how you're using your digital camera these days. You are a disgustingly neat person haha. Haha thanks! The neater I am, the more I can fit in my room. Are You a Blair, Serena, or Jenny?